StoriumEdu is an online multi-player game that turns kids into motivated, skillful writers. 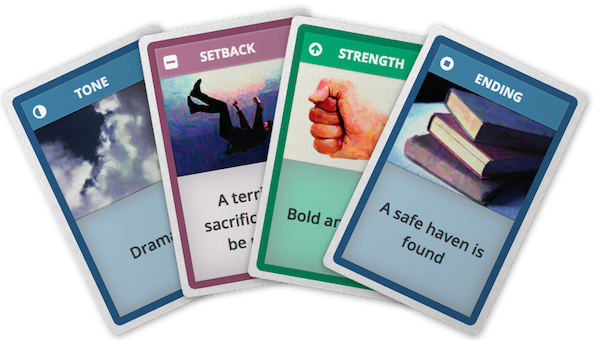 Virtual story cards and fun game mechanics inspire writing, while student creativity and collaboration drive the heart of the story. StoriumEdu has fantastic potential for homeschoolers, so we are happy to announce the start of our invite-only homeschool beta test. Participation is free — we simply ask for your feedback! We provide direct, unlimited support to help you with any questions. To gain access, simply join our homeschooler waiting list and we’ll contact you shortly! Read our beta test FAQ below or learn more about StoriumEdu on our homepage, which includes a short video overview. The homeschooler beta is for anyone playing outside of a traditional classroom setting. In particular this includes families and community homeschool co-ops. None! All we ask for is your feedback. Once the beta ends, an affordable subscription fee will be announced, but all beta participants will receive extended free access as a thank-you. Build student motivation and confidence in writing; develop critical reading and thinking skills; teach history by telling stories in historical time periods; build empathy though roleplay… and more! You can be up and running with StoriumEdu in under 30 minutes, and games can finish in under an hour once students know the ropes. Or take it further: create your own fictional universes and tell long-form stories in them. Games require 2-4 players. Parents may play in games but are not required to. Single-student play is possible with a parent as the second player. Your students only play with others that you invite, and only in fictional worlds that you select from our library (or design yourself!) Designed for COPPA and FERPA, you’re in full control.